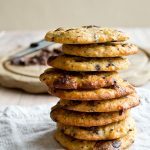 Almost too good to share: These healthy low carb chocolate chip cookies are the perfect combination of soft chewiness with a crunchy edge. You’ll never guess they are sugar free! Perfect for gluten free and Keto diets and suitable for diabetics. It’s been grey here the past few days, which has made me crave comfort food. And what is more comforting than a freshly baked cookie??! These Keto cookies are an adaptation of an old family recipe. The reason for their supreme popularity in our house was not just the simple fact that everyone likes chocolate chip cookies. No! They beat all the chocolate chip cookies in the neighbourhood because of my mum’s secret ingredient: double (heavy) cream. It makes them taste richer, creamier and infinitely more yummy. I replaced the wheat flour with almond flour and the sugar with erythritol. Instead of using milk chocolate, I settled on 85% dark chocolate. As half a bar (50g) is distributed between 10 cookies, the carb and sugar content is kept low. If you can source it, you can also use sugar free chocolate or sugar free chocolate chips. 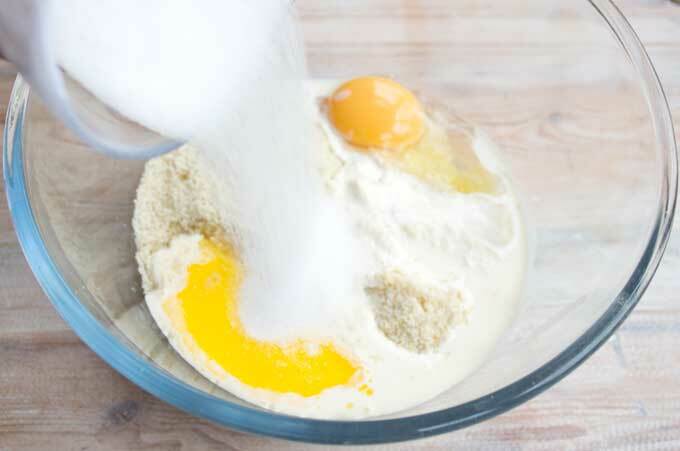 First, you add your almond flour, egg, cream, butter, vanilla extract and granulated sweetener into a bowl. 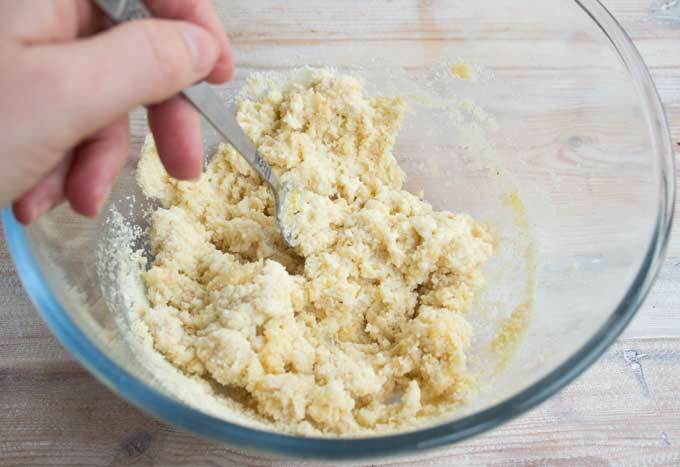 To my UK readers – if you use ground almonds, add an extra couple of tablespoons as ground almonds tend to be coarser than almond flour. You can mix everything with a fork – it comes together really easily. Let the batter sit for a few minutes to let the flour absorb the moisture. Now, chop your chocolate. 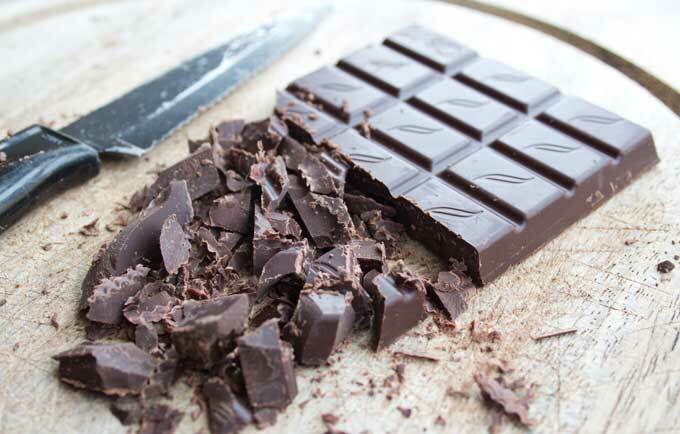 Any chocolate with a cocoa solids content of 85% and above is fine. If you can get hold of sugar free chocolate, even better – it is pricey though. Lily’s is popular in the US (they even sell ready-made chocolate chips) and in the UK you could go for Cavalier. Want to make your own sugar free chocolate chips? 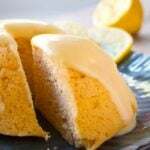 Check out this easy recipe from my blog! 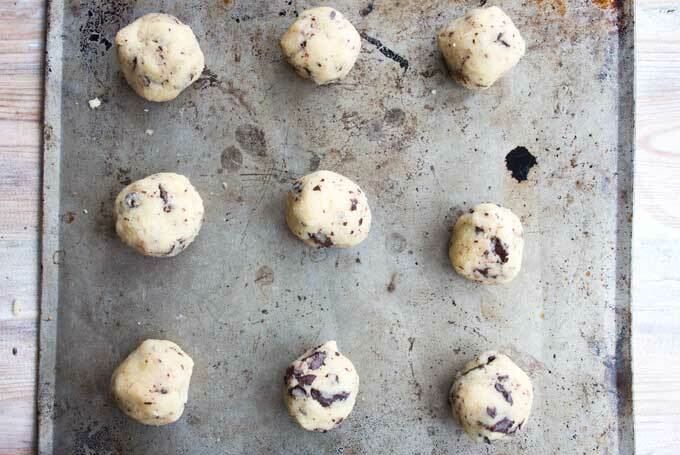 Roll the batter into little balls (or portion them with a cookie scoop) and place on a baking tray. The dough will still be a tad soft and sticky. TIP: Use baking/parchment paper to prevent the cookies from sticking. I had run out, so I greased the tray with butter. 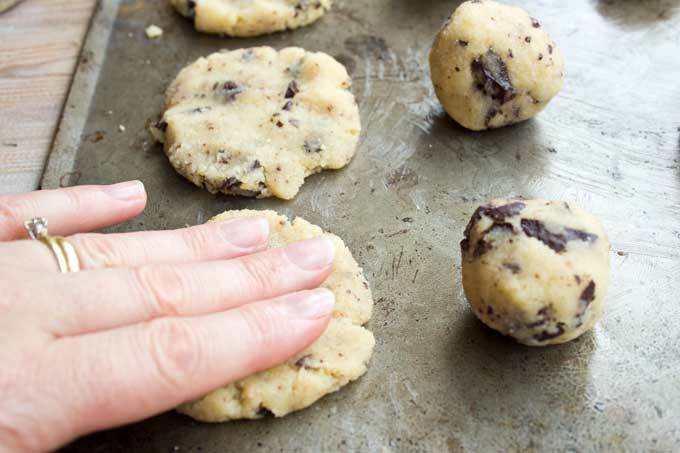 Flatten the cookies with your hand. They should be about 1/2 centimetres thick. Then bake in the oven for around 13 minutes. 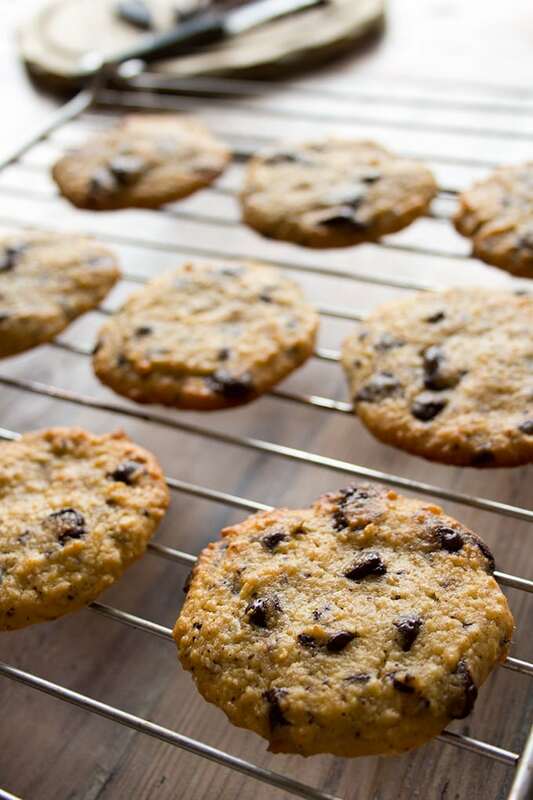 As almond flour does not contain gluten, low carb cookies are always softer than their wheat counterparts.The browned edges still have a lovely crunch though. The cookies are really soft and fragile when fresh out of the oven. DON’T WORRY. They firm up as they cool down. If you like your low carb cookies softer, just make them thicker and reduce the baking time to 10 minutes. For crispier cookies, flatten them further. Can you make these cookies with coconut flour instead? Yes! 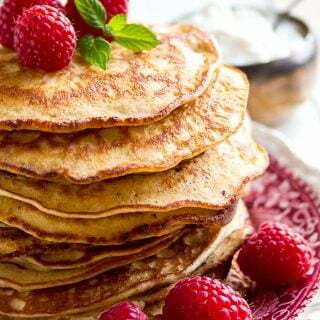 If you prefer coconut flour over almond flour, simply halve the amount of flour stated and use 50g or 1/2 cup of coconut flour. Coconut flour absorbs a lot more moisture than almond flour, that’s why you need less of it. You may want to add 1/2 a teaspoon of xanthan gum to make them a little firmer. NOTE – I love, love, love dark chocolate. That’s why it was a no-brainer for me to use dark chocolate in my healthy chocolate chip cookies. If you have picky children in the house or simply are a milk chocolate person, do try to source sugar free milk chocolate. Check out the links in the text above – Lily’s in the US and Cavalier in the UK both offer stevia-sweetened milk chocolate, for example. You can find sugar free chocolate on Amazon and in health food stores. If you’re a healthy cookie monster like me, you might also like these coconut shortbread cookies of these super-crunchy Italian sugar free walnut kisses. Made this recipe? Give it a star rating below! 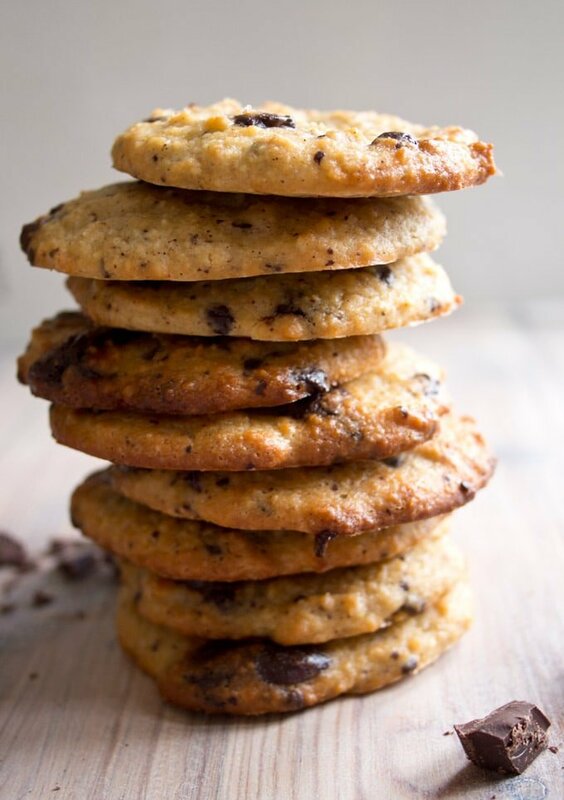 Almost too good to share: These healthy low carb chocolate chip cookies are the perfect combination of soft chewiness with a crunchy edge. Bake for ca 13 minutes or until the edges are nicely browned. They are soft when straight out of the oven but firm up as they cool down. The mixture makes 10 cookies with a diameter of around 6 cm. Nutrition is calculated per cookie. If you like chewier cookies, make them thicker than 1/2 cm and reduce the baking time to 10 minutes. For crispier cookies, flatten them further. 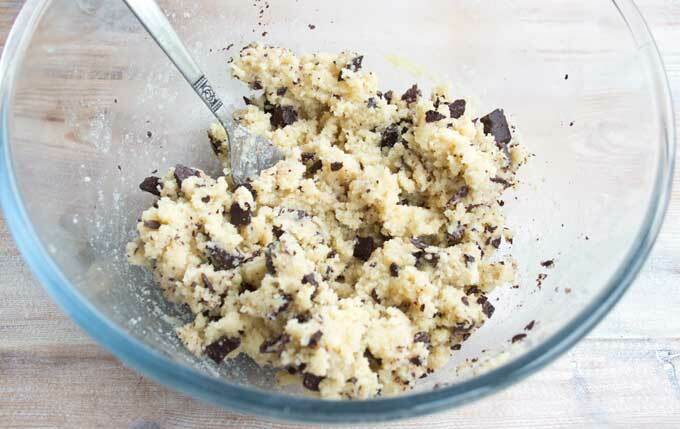 This low carb chocolate chip cookie recipe also works WITHOUT the egg! The end result is crispier (but also more fragile when hot). Add an extra splash of cream to loosen the dough. This recipe was first published in September 2016. It was updated in August 2018 with new photos and a recipe change to reflect how we make these cookies now. OMG, these are soo good! They taste very close to the real thing. 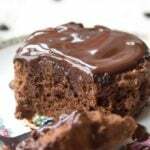 I used Swerve erythritol and Lilly’s dark chocolate baking bar. I doubled the butter and added more vanilla. Fantastic. Hi. Can I add gluten (I’m more concerned with low carb and no sugar) rather than xanthum gum or to almond flour in general? Hi there, I’ve never come across gluten on its own, but I guess it would do the same job! If you want to add gluten why not just make regular cookies? These are SO good! They made exactly 12 cookies. I might try adding unsweetened coconut next time I make them. Thanks for an amazing recipe!!! Can you use granulated monkfruit instead of powdered sweetener? I have never used pure monkfruit, so I’m not sure about the quantities. I often use the Lakanto sweetener, which is erythritol plus monkfruit. You can use a granulated sweetener like this, but you can also pop your granulated sweetener in a food processor or use the attachment of a stick blender to powder it. I am not sure if I am reading this incorrectly or not but April asked if she can use Monkfruit instead of powdered sugar but in the recipe it calls for granulated sugar…I am a bit confused…should I sue powdered sugar or granulated sugar? I have the Lakanto sweetner (golden) but I also have swerve powdered which should I use? Thanks! Hi Jacey, you are right! I got confused because April Asked about powdered sweetener. You can use both powdered sweetener OR granulated sweetener. 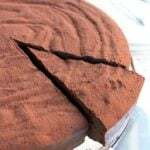 There are some recipes such as mousse, ice cream, chocolate or recipes with very liquid dough where powdered sweetener works better than granulated. But as a general rule, any recipe calling for granulated sweetener can also be made with powdered sweetener. 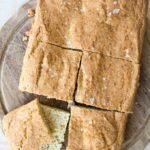 In my opinion, the Lakanto brown sugar replacement would work really well in this recipe (I have it at home and even my sugar-loving daughter likes it). That’s what I would use. Thanks Katrin – I made these but omitted the egg as I like my cookies crispy..I also made them fairly thin but next time I would go thinner! If I could add a picture I would – they photograph very well! Excellent recipe -thanks so much! Just made these and eaten the first one. I did the usual thing I do with keto bakes and was disappointed with the first bite, as of course it doesn’t match my taste memories of 5 for £1 supermarket cookies. But now I want to be eating another. I used Truvia and the mixture seemed quite sweet before baking but that dulled slightly with baking, so I’ll add a bit more next time. There’s no way to replicate a supermarket cookie with low carb ingredients, I’m afraid 🙂 But I can tell you that after a while of eating your own baked stuff if you then taste a supermarket cookie, you’ll probably think it’s sickly sweet and totally yuk. So hang in there!!! Your recipes never disappoint. Thank you for delicious recipes for a healthier lifestyle. These cookies are a bit and super easy to make. I added a little bit of coconut flour, salt , and baking powder and baked the cookies for 13 min. I also made them smaller and ended up with 18 little cookies which are a little crispy on the outside and soft inside! Hi. Whats a great substitute for heavy cream? Can i use almond milk instead? Thanks. You could use coconut cream, as it has a similar consistency. Hi Kim, I guess it comes down to personal preference… hope you managed to get them the way you like them! THat’s a good idea, thanks for your comment Rebecca! WOW! Those cookies look great and so easy even a guy could make them! (ME!) 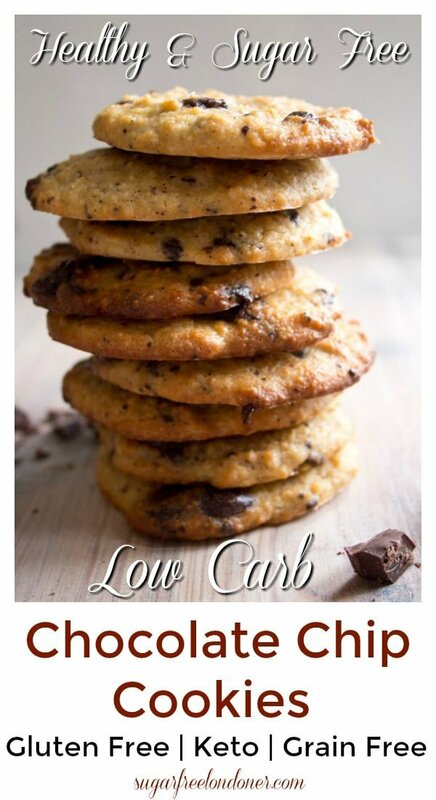 But, I’ve never seen a chocolate chip cookie recipe so low in carbs. It looks like a respectable size cookie at 6cm (2.5″), but really only 3.6 grams of carbs and 1.8g net carbs??? If it’s true, i think you are genius! Hi Jackie, I find that low carb cookies always end up a bit softer than wheat cookies. I have made these with regular ground almonds (almond meal), so I don’t think your almond flour was the problem. If you make them really flat, they won’t be cakey and end up crisper. These are amazing!! Thank you for making a cookie that smells great and taste as good as it looks. Bonus. Did not raise my blood sugar!! My four year old daughter and I made these last night, and they were amazing! She loved them, and my husband even had a couple. He normally doesn’t like anything that is healthy! I’m going to make another batch to send in my kid’s lunches this week. Thank you for a great recipe. That’s just what I wanted to do, but my school has a no nuts policy! Will have to find something else for them,! 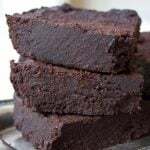 I made them, there delicious, but feel I went wrong somewhere, the mixture was loose and wet not like yours, they still cooked fine, but very soft. So I divided the mixture and cooked some of the soft ones, then Added more almond flour to the rest, they came out dryer but lovely too, I added a tablespoon of coconut flour to absorb the wetness. But still soft not crispy . I may have not measured the butter properly, and only had single cream whipped, would that make them soft? Thanks for a lovely recipe though, just started keto and needed something sweet. Hi Kate, if you try again, definitely measure the ingredients. Whipping the cream MAY have made them softer because when you whip stuff you add air, which would lead to a fluffier cookie. 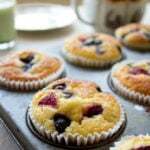 Another thought – almond flour baked goods are very soft when they’re still warm and firm up once cooled. They generally will always be softer than wheat flour cookies. I hope this helps :). 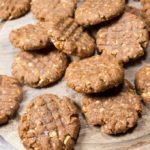 This keto cookie recipe is just brilliant! It really is! Just curious to know… the secret ingredient of cream, don’t always have this to hand. Do you think Natural Greek Yoghurt would work? Has anyone tried? Hi Jenni, interesting thought – I guess it would depend on how mild your yoghurt tastes. Maybe coconut cream would be a good substitution. And if in doubt, just use more butter. That’ll definitely work. Maybe I’ll investigate and report back! Would powdered sweetener work as well in this? Sure! You’ll probably need an additional tbsp of sweetener though – make sure you try the dough before baking! Can I use coconut flour instead as almonds give me a headache? You can try using 1/2 the amount. Coconut flour is more absorbent than almond flour so you’ll need less of it. Hi how long to cookies stay fresh for? thanks for the great recipe. Mine turned out quite soft, so I added more flour (2 TBS), and some 1 TBS cacao. Still very soft and they got huge. Any idea? I used 1 cup, not 100 gr flour, maybe that’s the issue? I added 4 mins of baking (had to put it on broil at the end to get some colour) as the American oven here only does bake, bottom heat, or broil, to heat. 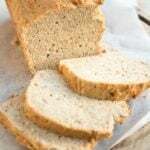 Thanks a lot, your recipes really help me convert my family to low sugar, low carb for snacks, bread etc. The peanut butter cookies got a “still tastes healthy”, but they were all gone after tea. Oh, I’m so happy you’re enjoying the recipes. You know you’re onto a winner when people under 10 years old give a recipe the thumbs up 🙂 As for the cookies, 1 cup and 100 g should be about the same amount. Maybe it had something to do with your oven? They can be quite different. I’ve also found that almond flour brands differ A LOT in terms of texture. If you prefer a crunchier cookie, just try using less of the cream next time – or even leave it out completely. I have since made a pie crusts using only almond flour and egg and it becomes super crunchy. Can I just say THANK YOU!!! Ever since I went Keto, Cookies have been my weakness, it’s all I craved day & night. 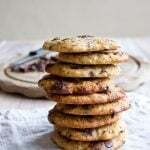 This recipe tastes AMAZING and now finally I can enjoy cookies again! You are so welcome Georgia! I love these cookies too and I’m so glad you’re enjoying them!!!! Finally, a low carb, and gluten free cookie that actually lives up to being called a cookie.Have wasted so much money and time trying to believe other people’s claims that they have the best. these are truly a good cookie. Easy,quick, and made with items most low carbers have on hand. thanks so much. Hi! I’d like to try this recipe but erythritol is not readily available here in the Philippines. What do you suggest I use? Would stevia work? Thanks very much. Hello Roselyn, stevia would definitely work. Or xylitol. the Nutrition facts is that for one cookie? or is it for the whole recipe? so I would divide that by 10 cookies? Hello Daisy, I calculated the nutrition per cookie. I just made this and it’s nice and brown on the bottom, but they aren’t crispy. It’s soft and pillowy and tastes good. Maybe I didn’t convert the almond flour correctly. I am in the USA. I researched the conversion and it said 100 g = 1 cup, so I used 1 cup almond flour. Was that right? I feel like the cookie dough could have used more flour. Hello Keri, thank you for your comment. Your conversion sounds correct. 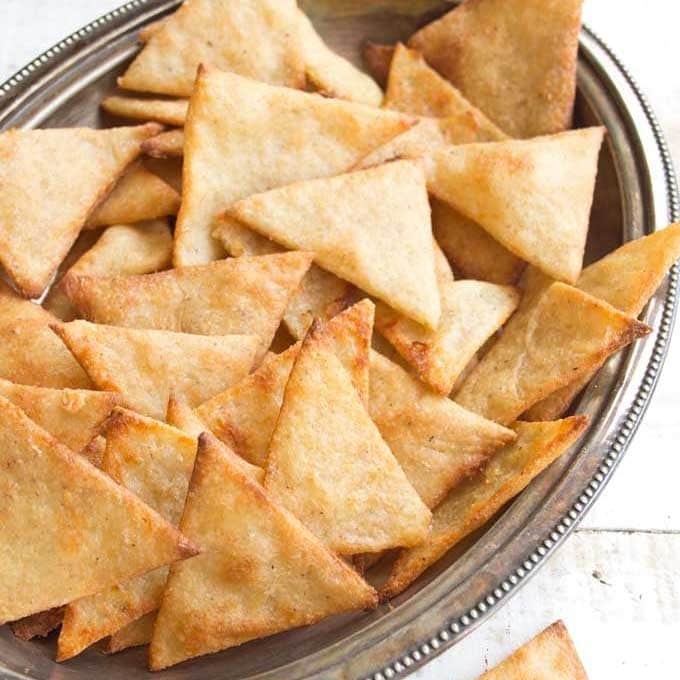 You’ll just never get the same kind of crunch you achieve with wheat flour. I actually used ground almonds in the recipe, not almond flour, but this should not make a huge difference. If you are after a denser cookie, just experiment a bit and try using a bit more almond next time. In the end, it all comes down to individual preference. My cookies didn’t look as golden as yours and they were soft – not crisp. I used coconut oil instead of butter, could that be the reason why? Hi Lauren, that could be the case, not sure. Also, ovens can be tricky beasts. Maybe you need to set yours a little hotter or just leave the cookies in for longer. Hello, it’s British for heavy cream. How much almond flour would you use for this recipe? Are you actually grinding the almonds yourself? I just want to use the pre-made flour. These look pretty amazing! Sharing! Lovely looking cookies. Math should always involve cookies somehow, as it would be more enjoyable. These look perfect! I still haven’t found a great chocolate chip cookie recipe. Oh these look SO good! Love that chewy/crispy combination! I hat to laugh. My daughter is going through the “I hate math” stage just now in middle school (6th grade), and I am telling her the same thing – that math is everywhere. It doesn’t help. But, I am sure that offering one of these delicious cookies as an after-you-finish-your-math treat would help. Thanks for the recipe. Bribing is one of my favourite techniques when it comes to homework!